The Secretary of State’s much-touted system that allows customers to virtually take their place in line ahead of a branch visit has been down since the end of February, leading to customer complaints and long wait times. At branches across the state throughout March, signs have been posted advising customers, “The MI-TIME queuing system for customers to get in line or monitor their places in line at our branches isn’t providing quality customer service,” and has been taken offline until further notice. The Department of State declined to provide an expected date for the system’s re-implementation. In the meantime, customers are forced to wait in line in person at branch locations. 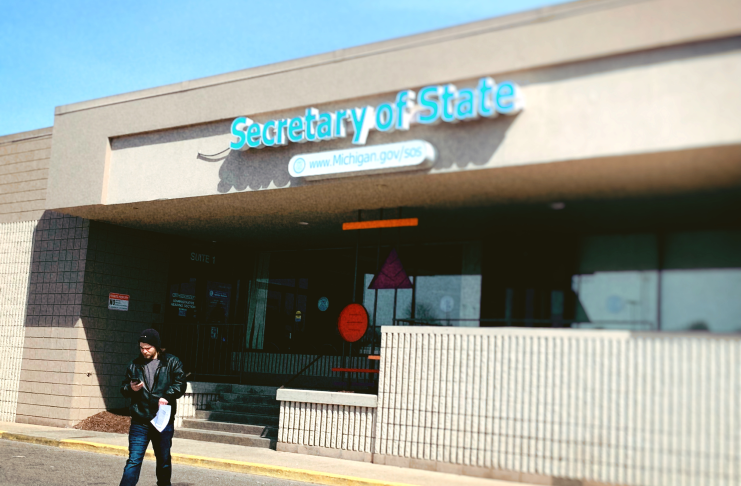 The system, called MI-TIME, was launched in early 2014 in the 10 busiest Secretary of State offices and expanded to 43 locations statewide by the time the plug was temporarily pulled on Feb. 28. It has two components: the “virtual line” system, and a system that allows customers to schedule appointments in advance. The latter is still in use, but has faced complaints about the scarce availability of those appointments. Notice posted on the website. According to Starkey, four branches are still using the virtual line component as test cases through which the department will “recalibrate and reconfigure” its prediction of wait times. Starkey declined to reveal the branches in which they’re doing so, saying that the subsequent increase in customer traffic would hurt the accuracy of the project. Benson pledged during her campaign to visit all 131 branch locations during her first 100 days in office, and guaranteed wait times of no more than 30 minutes. Regarding the former pledge, the department says Benson has visited about “75 percent” of the state’s branches and is “on target” to meet her goal. But the latter promise is far from realization. The department’s Chief Operations Officer Winnie Liao told MLive that some customers have experienced “swings of up to 270 minutes” this year between their expected and their actual wait. “Taking [MI-TIME] down so we could reconfigure and recalibrate… is certainly one piece of ensuring we can get to the 30-minute guarantee, but there are a number of other pieces as well,” Starkey said. inaccuracy. There’s no way to track that claim, however, as the Department of State was previously tracking branch wait times through the now-disused virtual line system. MI-TIME was developed by the California-based vendor QLess for a total contract of $4.3 million. Alex Bäcker, QLess’ founder and CEO, described the difficulty inherent to implementing a single system across a group of branches with their own unique characteristics. The Department of State’s spokesman told the Advance that the system won’t be back online until they are “comfortable providing an accurate time and providing the level of customer service that we expect.